I mean.... this may or may not be the third post since I've started this blog 2 weeks ago where I reference how obsessed I am with coral. But I'll just go ahead and tell you again - I'm OBSESSED! It's such a fun color for spring, and makes you look super tan (and super blonde for all you blondies)! I love love love the idea of pairing coral with leopard to add a little somethin' somethin' to your day! I think there IS such thing as too much leopard... but when paired correctly with a stand-out color like coral, you'll make the perfect statement! Here are some of my favorite leopard + coral looks I've come up with! What are some of your favorite leopard statement pieces you've come across recently? Girl I feel like you read my mind! 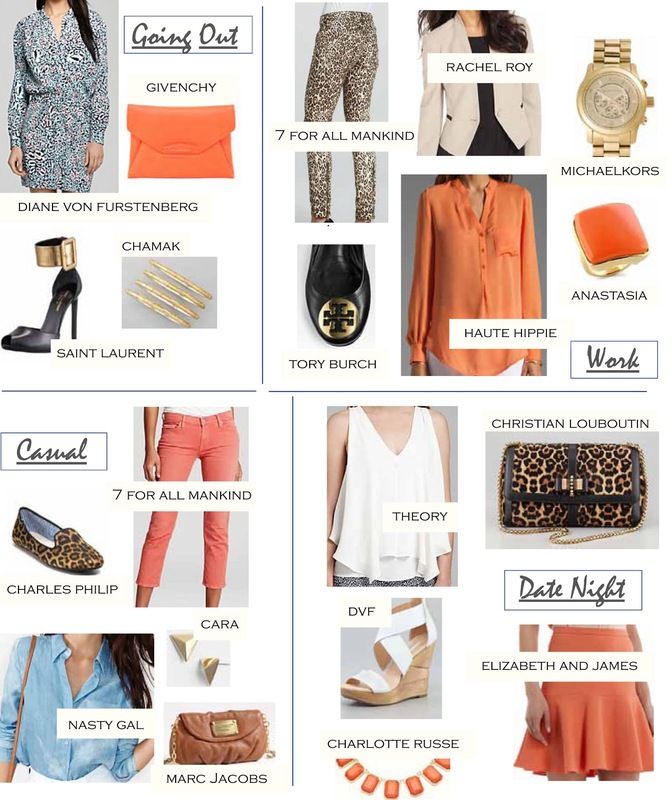 I have a crazy obsession with coral lately and I'm loving it paired with leopard!!! Ohhh girl, you can't go wrong with this pair! I loooooove coral too, it's such a flattering color! I love coral too, its just such a beautiful color!! Great picks! Coral plus leopard = amazing. I love your date night look! Omg girl I am OBSESSED with coral!! I am actually on a hunt for a coral lipstick!!! LOVE the date night look.. Thanks Ashley! I have Chanel in Chalys, MAC in Vegas Volt and YSL in Extreme Coral. Check 'em out! Leopard and coral is definitely a fabulous color combo! Definite inspiration! Thanks for stopping by my blog and the follow! I am doing the same! Thanks so much, Kenya! I appreciate it! ME TOO! Just the best, right? Thanks so much Mira! You're so sweet! Oh I love coral for the summer with a tan! I love pairing it with turquoise or white too. :) Thanks for following, I'm following you back! I love coral too, especially for nail polish this time of year. Thanks for following...following back! Thanks so much Tara! Coral nails = so fun! Coral is one of my favorite colors for spring/summer! I am also obsessed with coral! I love how you paired it with leopard print (another favorite of mine). That going out outfit is so cute! There are lots of women perfect wearing accessories like shoes, mini skirts, bags, pant all of most uses women accessories. Great post and suggestion to select the products. All of them are looking amazing!!! !